Pacers Bikeshare will be $5.00 from December 1 through February 28, 2018. A day pass provides access to all 250 bikes in the system allowing pass holders to take an unlimited number of thirty minute bike share trips in a 24 hour period. The $5 Winter Pricing will be in effect this Friday, December 1 and run through February 28, 2018. 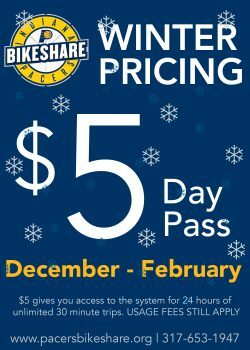 $5 Day passes are available at each of the 29 Pacers Bikeshare station kiosks, on the BCycle mobile application and online at www.PacersBikeshare.org. Usage Fees apply to any trip longer then thirty minutes.